Russia gives Afghanistan 10,000 assault rifles, but abstains from joining American efforts at peace talks. 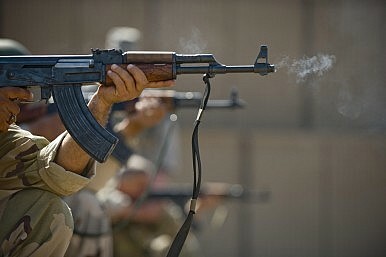 Wednesday, Afghanistan accepted a gift of 10,000 AK-47s and millions of rounds of ammunition from Russia. In recent months there has been much discussion about increased Russian engagement with Afghanistan, although Moscow’s cooperation with Washington’s initiatives–such as peace talks with the Taliban–remains seemingly out of the question. Twenty-seven years ago this month, the final Soviet troops withdrew from Afghanistan, where they’d been fighting a war for a decade. The communist government of Muhammad Najibullah, which they left in Kabul held out for three more years until the collapse of the Soviet Union cut off the financial inflow from Moscow, estimated at $3-4 billion annually, and the mujahedin closed in. “Terrorism is our common enemy,” Atmar said at the handover. Last year, hopeful beginnings to peace talks with the Taliban led to deep disappointment as the revelation of Mullah Omar’s death two years ago tossed the insurgency into a degree of internal chaos and damaged the Afghan administration’s efforts to repair relations with Pakistan. In 2016, however, the peace process is again being given a try, although most regional observers are skeptical that the planned talks will accomplish much. The Quadrilateral Coordination Group (QCG)–which includes Afghanistan, Pakistan, the United States, and China–met earlier this week and made a statement expressing support for planned talks between the government of Afghanistan and Taliban representatives in the first week of March. The chief of the Pakistani Army, General Raheel Sharif made a one-day visit to Qatar on Monday to talk with officials there. The Taliban maintain a political office in Qatar and General Sharif’s visit is seen as laying the groundwork for further peace talks. However, it’s not clear who from the Taliban will show up at the talks. The group–which rose to power in part because of its internal unity vis-a-vis the extremely fragmented mujahedin–has fractured in the wake of Mullah Omar’s death. The new Taliban leader, Mulah Mansour, has reportedly set preconditions for talks and other factions have rejected them outright. NATO’s drawn-out withdrawal is source of much anxiety in Afghanistan. As the Afghan security forces took the lead in combat operations over the past year their casualty rates have skyrocketed and the rates of civilian casualties have risen as well. Beleaguered and dependent on foreign aid for funding and supplies, the Afghan forces welcomed Russia’s donation. Atmar, as reported by TOLOnews, said that Afghanistan is still in talks with Russia for further aid, possibly to include helicopters. With an economy in recession, bottom-barrel oil prices with no near hope for recovery, and commitments elsewhere (such as Ukraine and Syria), Russia may not be in a fiscal position to give Afghanistan much beyond its surplus of AK-47s. One thing seems to be clear, the old days of NATO-Russian alignment when it came to Afghanistan are long gone. The Other Peace Talks: Afghan Women, Millennials, and Social MediaUS-Taliban Talks: What's on the Agenda in Doha?Without Regional Cooperation, Afghan Peace Will Remain ElusiveTalking With the Enemy: Why India Needs to Engage the TalibanWhy Does Pakistan’s Release of a Key Taliban Leader Matter?